Looking for something a little different to do this Christmas? 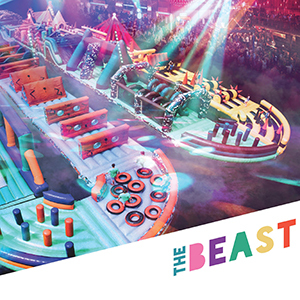 Then why not tackle the world’s largest inflatable assault course: The Beast! Returning to the UK at the NEC, Birmingham, this 272m long inflatable of 32 obstacles will challenge you, make you relive the ‘90s era of game show classics and, most importantly, be an incredible night of bouncy fun. As you tackle The Beast, a live DJ will be mixing the tunes to create the perfect soundtrack as you run, dive and dance your way through the course; meanwhile, an especially curated lighting show will give your experience an extra element of drama, excitement and fun. Once you’ve defeated this monster indulge in some of Birmingham’s finest street food vendors and wash it down with craft beer, tasty cocktails and even Prosecco on tap! Open to the public for eight days only, The Beast is a perfect outing for offices, friends, family and Christmas dos. Buy your tickets today to avoid missing out!